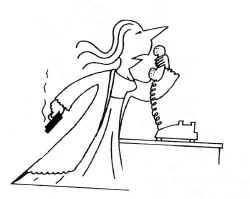 I never wanted to be a slave to my answering machine! For all I care, telephones and answering machines can be abolished. I love email and its nonintrusive means of communication. The only reason I ever bought an answering machine in the first place was so I could screen my calls (not from you of course). Before the machine, my phone used to ring a lot, and when I didn’t answer it, people knew I wasn’t home. But no, that’s not enough. Apparently, they need to hear my voice tell them I’m not home. Another reason for the answering machine was the rise of telephone solicitations: Home improvement, charities, and the ever-growing credit card phone solicitors who wooed me. How nice of them to think of me, and they think of me a lot! Thanks to phone solicitation, I am now in group credit counseling. Is the answering machine the answer? I bought an answering machine and recited, “I’m not in right now. Please leave a message …” From the messages I received, you’d think I denounced my country, my grandmother’s country, and my uncle in the French Foreign Legion. “Hey, what kind of message is that? Call me,” said one friend. I changed the message. “You call yourself a comedian? You can do better than that! Call me right away.” I don’t remember ever calling myself a comedian. I changed the message. “What’s wrong, Mon Cherie, you sound upset,” said my mother with her German-French accent. “Christy. I know you’re there. Answer the phone. I’m absolutely sure you’re there. Answer me now or else.” And that’s my best friend. No one was ever satisfied. The message to me was clear– I needed to come up with a clever and funny, yet informative but short message. I tried for another year. But the chant kept getting louder. “Change the message, change the message, change the message,” they chanted over and over again. One day I realized that very few people actually left a message stating why they called or why they wanted me to call them back. Friends called to let me know they had a bad day. Lovers called to tell me I gave them a bad day. Telephone solicitation may be a slight annoyance to most people, but it is doubly disruptive for people who work at home, as I do. Unfortunately, screening calls or ignoring the phone are not options for people who have family and friends’ melodramas unfolding in multiple time zones. I snapped. I wanted religion, and fast. But, coming from a traditional European socialist background (not to be confused with the U.S. left) and a family of dust believers, I had no idea what to choose. Do I go with reincarnation? Or should I look into the major religions such as the Heavenly religions: Islam, Christianity, and Judaism … or the un-Heavenly religions: Buddhism and Taoism. What about New Age? Do you see how a phone call can ruin your day? In this case, weeks? So, if nobody answers, just hang up, because I have gone into electronic oblivion — email.